Less than two weeks 'til submissions are due!!!! Prompting Closed! Claiming to Begin Soon! As you know, submissions are due in 4 DAYS, on JUNE 10!!!!. This is a reminder that all submissions need to be beta read and have the appropriate header at the top. Headers should be in the body of the attached story if you are doing fic, and should be in the body of the email if you are doing art. If you are looking for betas: We had a couple of responses to our call for betas and you can find their contact information here (LJ) and here (IJ). Additionally, you can check out the LJ community hp-betas. Yes, that's right! Your submissions are due in 5 DAYS!!!!! We are expecting lots of wonderful submission cramming up our inbox (hpdidimod@gmail.com) on June 10! We are looking forward to it! Hello all participants! This is just a reminder that submissions are due in less than two weeks!!! Please either email us or comment on this post (comments are screened) to let us know how you're doing. Early submissions make us happy happy mods. If there are any problems or if you require an extention, please tell us now, and we'll see what we can do. Submissions can be sent to hpdidimod@gmail.com. All fic and are should have the appropriate headers. Hello from your Mods! This is just a quick check-in since there is a little more than 1 month to go before fics and art are due! We hope you are getting along okay and are excited to see all the wonderful things you are coming up with. If you are in any way concerned about finishing, Please let us know!!! Requests for extensions need to be sent to hpdidimod [at] gmail [dot] com. 1) Fic and art are due on June 10. 2) All submissions should be sent to the above email address and should come with the correct header information and should be properly coded with HTML. Fic headers should be at the top of their fic. Fics should come as an attachment. Art headers should be placed in a separate .RTF or .TXT file. Headers and art should come as attachments. Headers are below! 3) All fics must be beta-read for SPaG. Don't forget that you can refer to the Rules & Guidelines if you have any questions. Additionally, we have screened the comments for this post, so feel free to ask questions here, as well. I'm also pleased that most everyone got their first choice! If you don't see it anywhere, then please comment below and let us know so that we can send it out to you as quickly as possible. Your assignments are due June 10th and we'll be checking with you in the middle of the fest to see how you're doing. As always, if you need to drop out then please let us know as soon as possible. If you have any questions than please let us know. The chance to claim has been extended by five days. If you'd like to claim one of the prompts available then you have until February 20th to make that decision. We have 10 participants right now and that's a really good number for our new fest, but I think we can get a few more. I'd like to point out a special portion of the form you fill out in the comments. We ask you to make three choices when claiming, but below that we ask for "Alternative: Own Idea." There you can make your own prompt, and as such do not need the prerequisite three prompt choices. Please make sure that your prompts do adhere to the guidelines surrounding the fest though or we'll have to reject your entry into the fest. Please make your claims on the claiming post. Thanks guys, your prompts will be sent out on February 21. The time has come to claim your prompts! And please pimp the claiming as well! Just copy and paste what's in the text box below! All you have to do is fill out the form below and then post it in a comment to this post. This isn't exactly an anonymous fest, but, for the sake of mystery, we're going to screen the comments anyway. We will be sending you an email containing your prompt and a few extra instructions/reminders anytime between Feb 20th and Feb 25th. Please let us know that you've received your assignment and that you will be able to complete it. If you haven't seen your assignment by the 26th, please check your SPAM and TRASH folders. If it isn't there, then send us an e-mail and let us know. We'll get them out to you as quickly as possible. Please pay special attention to items 6 (claiming a post) and 7 (submitting your work) on the Rules/Guideline page. If you need to drop out for any reason, let us know ASAP! Please give us three prompts you'd like to write for. Know your limits and claim only what you are able to fulfill. Art submissions can be single or multiple pieces, must be rated, new, properly labeled (for multiple pieces), and sent as .JPG or .GIF files. - No digital manipulations. After your first claim is submitted and approved, you may claim a second if you wish. Assignments are due by Midnight EST on June 10th. Fic headers are to be put at the top and your assignment sent as an attachment. Please refer to the PROMPT PAGE for the individual prompts and their corresponding numbers. Thank you to all who prompted. There are some awesome prompts submitted! Prompt claiming will start ASAP! For your reference, here are the submitted prompts for the DIDI Fest! Remember that when you claim prompts, you will be asked for your top 3 picks. Prompts will be claimed on a first come first serve basis. Stay posted for the Claiming Post! 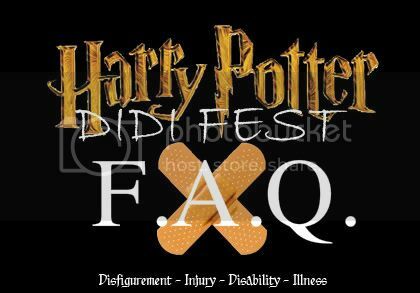 hp_didi_fest - A Harry Potter slash festival where fan-writers and fan-artists can come together and share their love of fics and art featuring characters suffering from, recovering from, dealing with, or simply living with Disfigurement, Injury, Disability, and/or Illness.